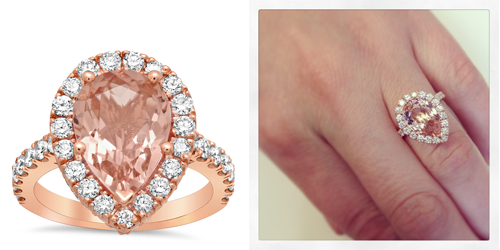 This fabulous pear shape ring set in rose gold is just a beautiful light peachy pink color. Personally, my favorite type of halo is a pear shaped halo. There is just something about the elongated shape that I love. Isn’t this just gorgeous? Nothing says spring like this bright fancy yellow fancy diamond engagement ring. 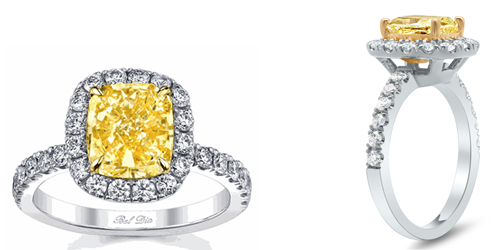 I absolutely love fancy yellow diamonds and the contrast between the bright yellow and the super white, sparkly diamonds. This halo design is one of our top sellers! This nature inspired ring features a lovely leaf pattern with diamonds that are set by hand. 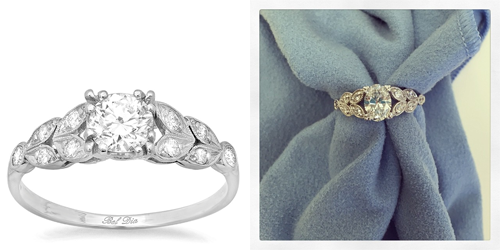 Here is this ring that was recently purchased but with an oval diamond in the center (shown on right). I love this! If you need assistance with a jewelry purchase, please do not hesitate to call on us. With three GIA graduate gemologists on staff, we are eager to help you select the perfect piece. Happy shopping!